Students use Drexel University’s Recreation Center for different reasons and a new music video that was launched by the Department of Athletics highlights some of these individualized motivations. The video, “Life Happens Within These Walls,” shows the diverse offerings of the Rec Center complemented by three distinct genres of music made by students from Drexel’s own Mad Dragon Music Group. Case said that the video attempts to dive into the minds of students and what’s going on with their lives to communicate why they utilize the Rec Center resources — whether it’s to hangout with friends, form new friendships, get over heartache, to alleviate stress or just to start off their days more healthily. “What we’re trying to tell you is that the Rec Center is a place — no matter what your day is like outside of the gym — when you come here, it’s a great place to be inspired, to meet other people and to be motivated,” he said. While most ads pertaining to fitness facilities fixate on offering the means to become bigger, faster and stronger, Case said this doesn’t tell the full story. He hopes the video can address the true driving factors in a more candid, wholehearted way. Though Case oversaw the process, which was a culmination of over six months of filming, planning and editing, it was almost entirely student-run. Matt Kopyt, a music industry student who works as a marketing specialist on Case’s team, approached Case with the idea of showcasing Drexel students’ musical talents when Case expressed an interest in creating a music video. The innovative Case, who never shuts down creative solutions, instantly agreed and Kopyt began recruiting Drexel musicians. Three different artists got involved, allowing them to connect to an even wider audience, including rapper Timmy Brabston, the rock band Broken Rib and singer/songwriter Mazie. The video, which begins with Kopyt ambitiously completing a workout to Brabston’s catchy rapping, then cuts into rocky riffs from Broken Rib as it transgresses into students doing a yoga workout in one of Drexel’s group fitness classrooms. It eventually leads to a female student doing a workout to Mazie’s soulful lyrics about heartbreak and wraps up with more students playing basketball on the court. The Rec Center is all about diversity and Kopyt said the music video and all of the students who helped contribute and film emulate that perfectly. 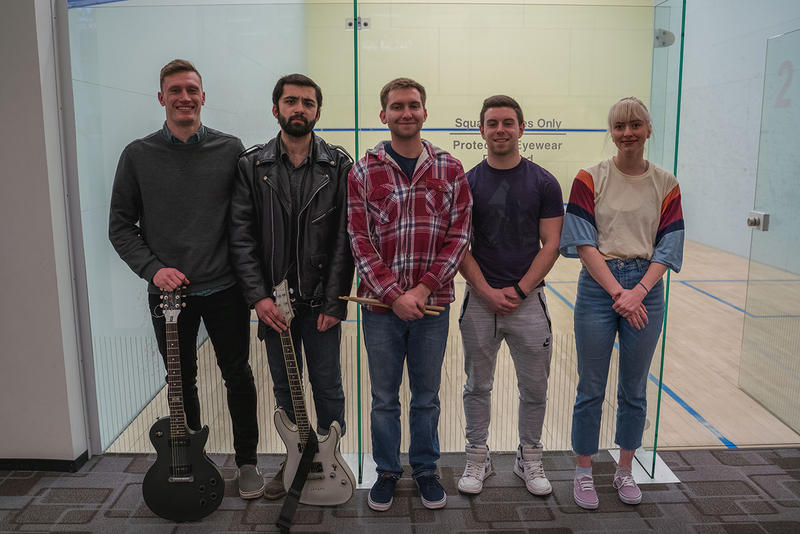 “We really wanted to showcase those three different genres and the three different meanings behind those songs to help uncover the different reasons and motivations individuals come to the Rec Center,” Kopyt said. And as students think about their own purposes for using the gym, Case said he hopes to make it clear that the gym is not an intimidating environment. This, Kopyt said, battles a common misconception. But overall, Kopyt made clear it’s not just about awareness. He said it is more-so about inspiring people to come in the door to commit to working on their physical and mental wellness. The video, which was released Feb. 21, comes before the third season of “My Rec Life” — another project Case and Kopyt work closely together on. The student vlog showcases the diverse offerings of the Rec Center to show how recreational athletics plays a big part in day-to-day of a college student. It also coincides with the department’s Balanced Project, which shows how the Rec Center plays a vital role in giving students a balanced lifestyle, and Case said the video helps bring the initiative full circle. Despite the different resources at the gym and the various reasonings behind why students use the facility, Kopyt said that students using the facility should ultimately feel a sense of togetherness. “Everyone is here doing their own thing but at the end of the day, that is what brings everyone together and that all occurs within these walls at the Rec Center,” Kopyt said.